A clean, elegant and working app landing page template. Built with bootstrap 3, HTML5, jQuery & CSS3. Elegant design, responsive layout and high-quality. Are you an app or game developer who wants to show your amazing and creative apps and games to your customers? And you are thinking of an app landing page for your app showcasing? Why waste time developing your app landing site by yourself doing hard work? Have no worry and relax. We represent you LUCY-the best Responsive App Landing Page designed with Bootstrap 3, HTML5 and CSS3. You can use this Responsive App Landing Page for any kinds of app and game. We have created a Responsive HTML5 App Landing Page Template to make your life easier so that you can concentrate more on developing your apps and less on creating an app landing website. 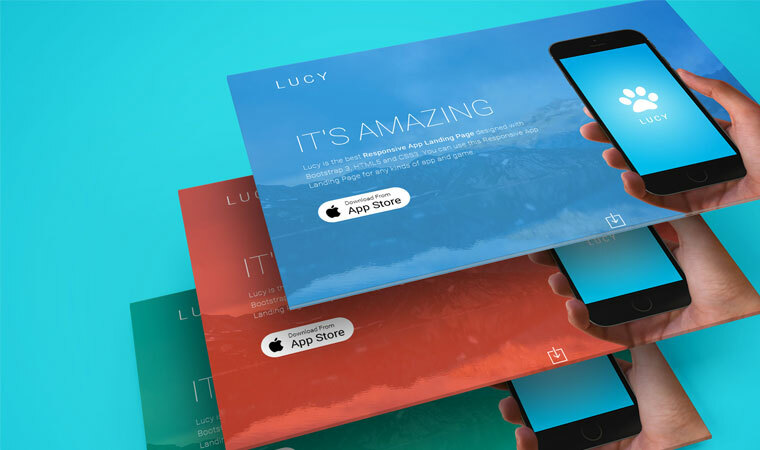 LUCY- Responsive HTML5 App Landing Page Template is nicely crafted with HTML5, CSS3 and Bootstrap 3. It is a unique app landing page template with six color schemes, included PSD format and well documentation.It is a one page HTML5 template. By building a website using this Responsive App Landing HTML5 Template, you will be able to showcase your apps or games or software products in a very stylish way. Those who are going to launch an app or game or a new product or service can easily use this Responsive HTML5 App Landing Page Template – LUCY! LUCY could be a high priced HTML5 responsive app landing template because of unique styles, color, and other features. But we thought we should give this template at a very low cost to our favorite app developers. It has a high-quality user interface with best user experiences. LUCY ensures elegant design and excellent UX (user experience). It’s one of the best Responsive HTML5 App Landing Page Template of its category. Excellent jQuery effects and CSS3 animations provide an elegant display. Not only that, its Creative sections let you showcase your apps or games or its amazing features without any clicking right on the front page. If you develop your site using LUCY- premium quality Responsive HTML5 App Landing Page Template, its grand and soothing design along with smooth browsing experience is bound to turn your potential clients and visitors into satisfied users- that we can promise you. The whole world is centering towards mobile phones, tabs or other handheld devices because of portability and ease of use. Even As your target population is going to visit your site with their handheld devices, it is a MUST for you to make your site Mobile-friendly. That’s why we have used the modern mobile first design concept to create LUCY. We created the template for smartphones and then scaled it up for bigger devices. It was tested on almost all browsers and each and every kind of devices such as smartphones, tablets, iPads and desktops to ensure you a glitch-free, smooth experience regardless of what platform you are using. We maintained this concept very carefully and accurately making LUCY a fully responsive app landing page template. Bootstrap 3 has made it easy to design a responsive mobile friendly HTML5 template. The grid system of Bootstrap 3 is properly maintained while coding. This Responsive HTML5 App Landing Page Template is 100% responsive and mobile ready. There is a bunch of awesome free responsive html5 Bootstrap website templates and responsive bootstrap themes in Themewagon. Know someone who is just as stoked as you are about Pebble Time? Share our campaign with them through the “Share this project” button at the top or below. Sharing is caring! As I own a app developing agency, I need to go to my customers through landing page. Lucy Pro has amazingly saved my time and let me done projects successfully. And, of course, the price is pretty reasonable. The multiple color variations, perfectly organized page, awesome fonts, and ample of features helped me creating an efficient landing page. Thanks for the beautiful page. It worked totally fine on mobile too.